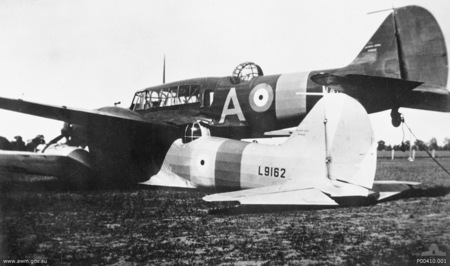 In 1940, two planes collided in mid-air over Australia. Remarkably, there were no fatalities. Even more remarkably, the pilot responsible for saving the planes was punished. Our story begins at the No. 2 Service Flying Training School (SFTS) at the Royal Australian Air Force (RAAF) Station Forest Hill close to Wagga Wagga, New South Wales (NSW). WWII was on, so Britain set up the Empire Air Training Scheme throughout its territories to produce as many fighter pilots as possible. They were to master instrument flying, flying at night, navigating cross-country, flying in formation, aerobatic stunts, dive bombing, and of course, aerial gunnery. 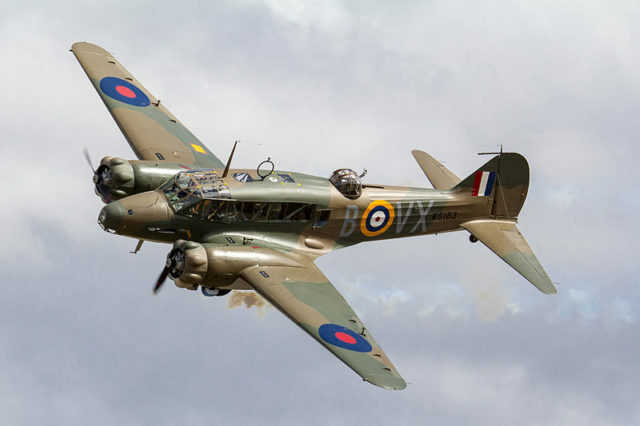 By July 1940, the school was still being built, but trainees had the use of Avro Ansons – British twin-engine craft designed for maritime reconnaissance missions. Enter our hero – Flying Officer Leonard Graham Fuller, born on August 9, 1918 in Cootamundra, NSW. There’s also Flight Lieutenant Ian Menzies Sinclair (December 25, 1913 Genn Innes, NSW). Next is Leading Aircraftman Jack Inglis Hewson (August 11, 1921 Newcastle, NSW). And finally, Hugh Gavin Fraser (April 9, 1913 Camberwell, Victoria). On September 29, 1940 the men went on a cross-country training exercise. Fuller piloted Tail number N4876 with Sinclair as his navigator, while Hewson flew the L9162 with Fraser as navigator. They were to fly over the towns of Corowa and Narrandera before returning to base. It all went well till they reached the town of Brocklesby – a place so small that according to the 2006 census, it only had a population of 238 people. Small wonder, then, that they only bothered to set up a hotel in 2000. Nothing much happens in Brocklesby, and about the only exciting thing they have is a pigeon club (seriously). As such, most Australians didn’t even know it existed… until Fuller came along, that is. The men were at 1,000 feet when they made a banking turn, after which it all went downhill from there – literally. Hewson flew a little below Fuller’s plane when the latter lost sight of him… but not for long because the two collided. According to Fuller, there was a “grinding crash and a bang as roaring propellers struck each other and bit into the engine cowlings.” Engine cowlings cover a plane’s engine, cool it by directing air flow into it, and reduce drag on the plane when in flight. So now the planes were stuck to each other. Hewson’s turret had not only wedged itself into the upper plane’s port wing root (the area beneath the left wing), but his fin and rudder had also whacked the underside of Fuller’s port tailplane (the stabilizer at the rear of the plane). It couldn’t possibly have gotten worse, but it did. 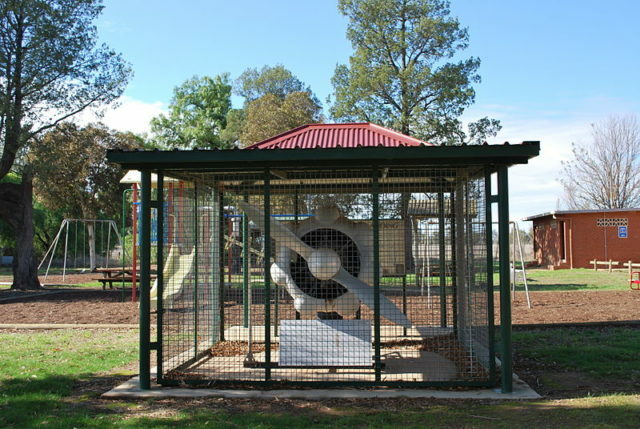 The Cootamundra-born pilot’s engines stopped working. Fuller tried to restart his engines, but it was a no-go. And a good thing, too, or his propellers might have sliced through the lower plane. 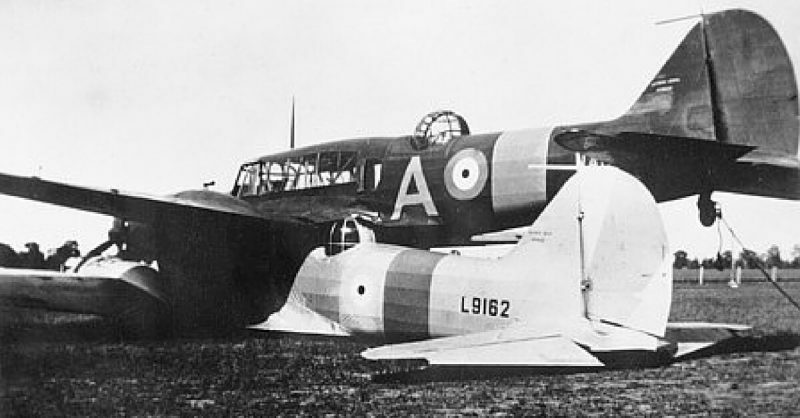 But Fuller’s propellers had already pummeled Hewson’s fuselage before conking out, so the damage was done. The Newcastle man had hurt his back. The fused planes began circling over the tiny town while its pilots wondered what to do next. Unable to do more, Hewson ordered his navigator to bail. Reluctantly, Fraser did just that. Fuller gave his navigator the same order, so Sinclair also jumped. Then he told Hewson to do the same. Despite his pain, and with a bit of maneuvering as well as a lot of swearing, the injured pilot managed it. So now there was one. Fortunately, the lower plane’s engines were still working. And while Fuller could no longer get his own to start, he was able to control his ailerons and flaps. With those responding and with the now-empty plane’s engines still running, Fuller considered his options. Scanning the ground below, he remembered his training. Fuller managed another 5 miles before zooming toward the ground below. Then he made an emergency pancake landing (the technical term for a belly flop without the landing gear extended) in a large open field. He slid some 200 yards across grass before finally stopping some 4 miles southwest of Brocklesby – putting it on the international map thanks to all the publicity it finally got. 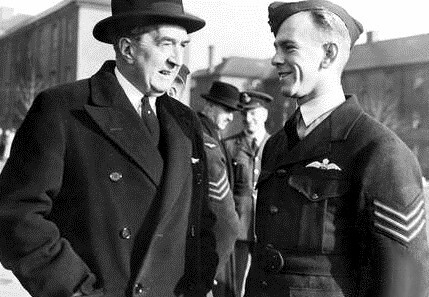 It would also receive a VIP – Group Captain Arthur “Spud” Murphy. Murphy and Captain Henry Wrigley became famous in 1919 for flying from Melbourne to Darwin – the first trans-Australian flight. By 1940 Murphy was also the RAAF’s Inspector of Air Accidents, which was why he flew directly from Melbourne to Brocklesby. The media loved it! Brocklesby could have been obliterated – especially since there wasn’t (and still isn’t) much of it to destroy. Fuller was a hero! Equally important, however, was that he had saved the government £40,000 – the combined value of both planes. Given the ongoing war, Australia needed to save as much money and resources as it possibly could. The planes were repaired and put back in use as training vehicles. Hewson got treated for his back, Fuller was rewarded with the rank of sergeant, and it should have ended there. But it didn’t. The RAAF wanted to investigate the incident more fully, so they put Fuller on gag orders while they did so. Unfortunately, he couldn’t resist the media spotlight and gave out several interviews. To punish him, he was confined to barracks for two weeks and was denied a week’s pay. The following month, they commended him and sent him off to Europe (where he received a Distinguished Flying Medal in March 1942) and the Middle East. Later that year, Fuller returned to Australia where he tragically died – but not in combat. While bicycling near Sale on March 18, 1944 he was hit by a bus. The man who survived an air collision and several aerial dogfights was killed on land by public transportation.